Those looking to move into the 1080p Smart TV arena without breaking the bank will find the Vizio E500i-A0 a formidable contender. 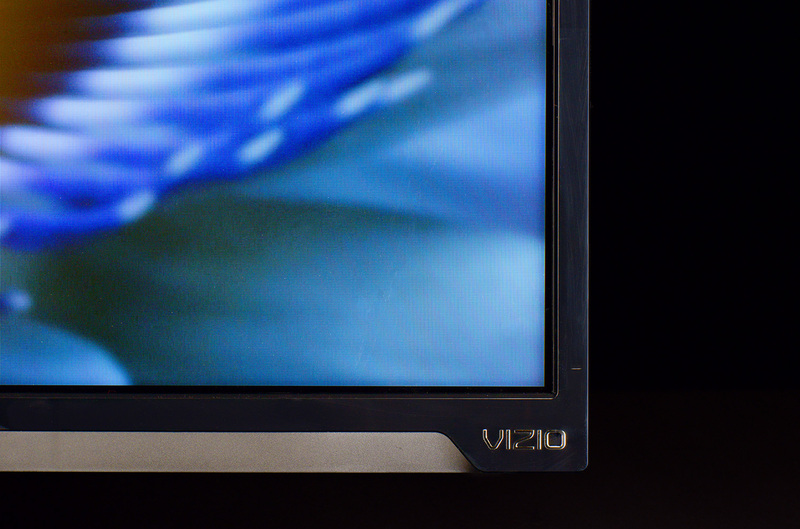 Vizio E0i series information: The review below is based on our time spent with the 42-inch E420i-A0 TV. However, the observations made also apply to the nine other models in this series. Samsung says that sets offer identical features (save weight and dimensions) and should offer similar performances. It’s no secret that “Smart” technology has revolutionized the way we live and work. Since the release of the first iPhone a mere 6 years ago, most of us have adapted almost every aspect of our daily routine to include smartphones. 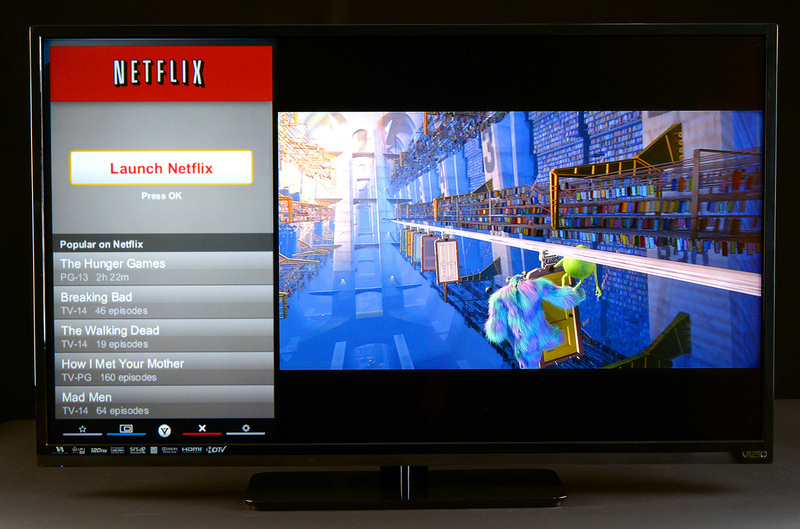 Less ubiquitous (and, arguably, less essential) however, is the Smart TV. Though convenient, Smart TVs have had less of an impact, likely because game consoles, Blu-Ray players and OTT boxes like the Roku offer the same functionality. As a result, the inclusion of Smart TV platforms and the price premium that comes with them seem unnecessary when considering entry to mid-level televisions. Rising star, Vizio, is striving to change that perception with models like its E420i-A0 (E420i). At $500, the E420i offers convenient WiFi connection, a bevy of streaming video and media apps, and specs in line with similarly priced “dumb” TVs from competitors like Samsung and LG. Still, we wondered whether Vizio could incorporate all those bells and whistles at bargain pricing and still bring a quality experience to your living room. After some extensive testing of the E420i-A0, here’s what we found. While toting the E420i around is no one-handed affair, it’s still very light for its size – just 23.15 lbs. with stand attached. One person can get the TV home and set up with relative ease. Pulling the E420i from its box revealed a fairly slim bezel with a gloss-black finish. The set’s 3.23 inch depth isn’t razor thin, but it’s still decent for a backlit LED display at this price point and unobtrusive enough whether wall mounted or atop a TV stand. 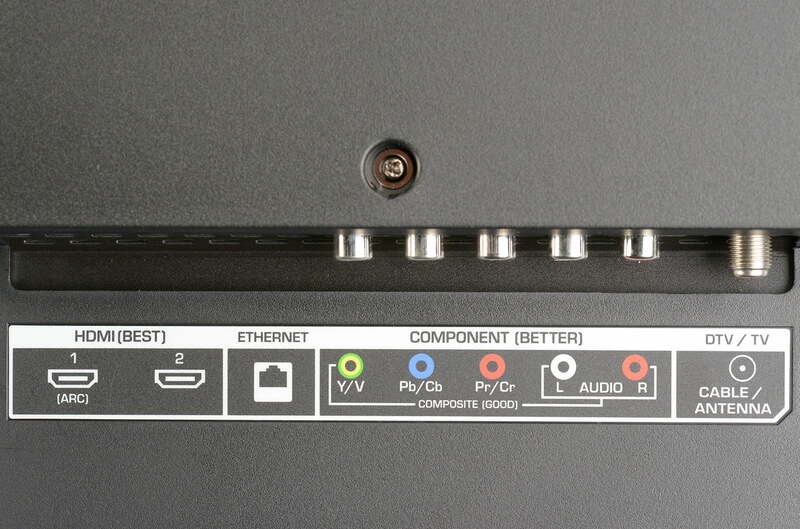 The E420i has a respectable selection of inputs for a TV in its class, the majority of which are clustered at the rear. Nestled inside a recessed bay we found 2 HDMI inputs, a Component/Composite hybrid input, an Ethernet port, and a standard Coaxial cable input. 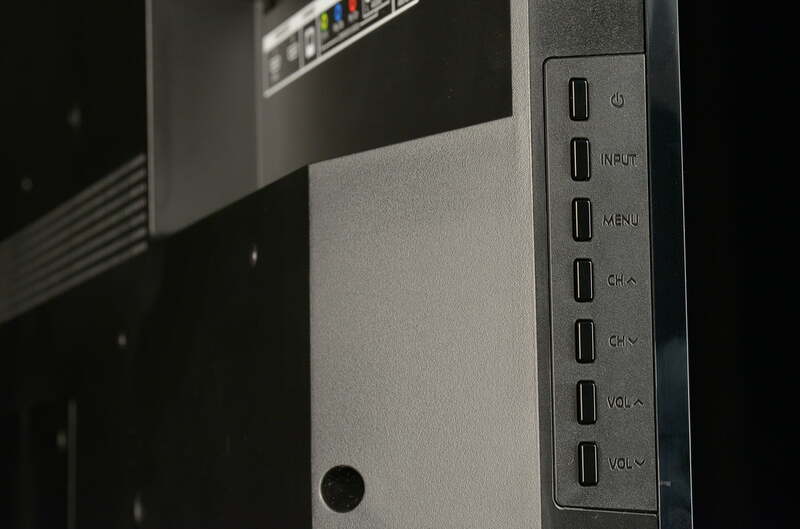 Though the small cubby allows for flush wall mounting with multiple components connected, we found it pretty difficult to get our hands in there, and connecting bulkier HDMI cables was a chore. 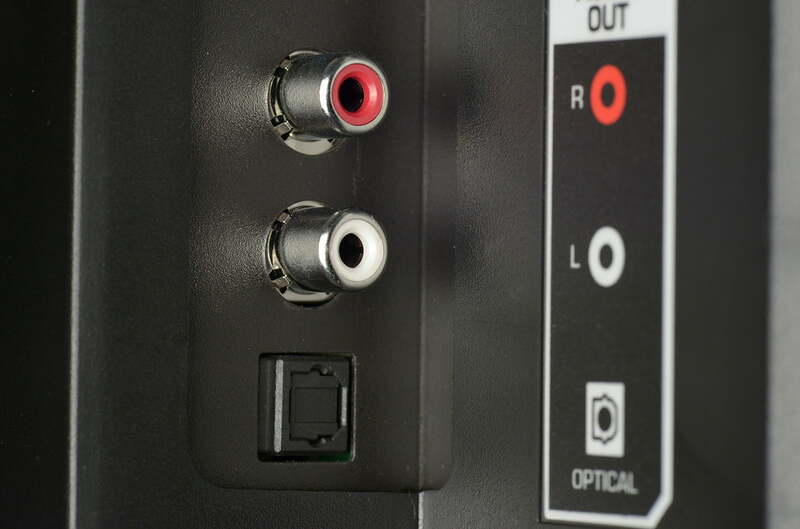 Positioned at the much more accessible side bay is a single HDMI input, a USB 2.0 input for photos and other media, and the TV’s digital optical and analog RCA audio outputs. Next to the array of inputs is a multi-button control panel for onboard navigation of the E420i’s settings, including power, menu, volume, and channel control. Vizio’s remote control gets points for style, but it is otherwise standard fare. We don’t like that it can’t be programmed to control other components, and at times we felt like the buttons were unresponsive, but we found general navigation to be intuitive. We especially liked the metallic “V” button in the center, which is easy to distinguish by touch and calls up the scroll bar at the base of the screen for access to the E420i’s app collection. 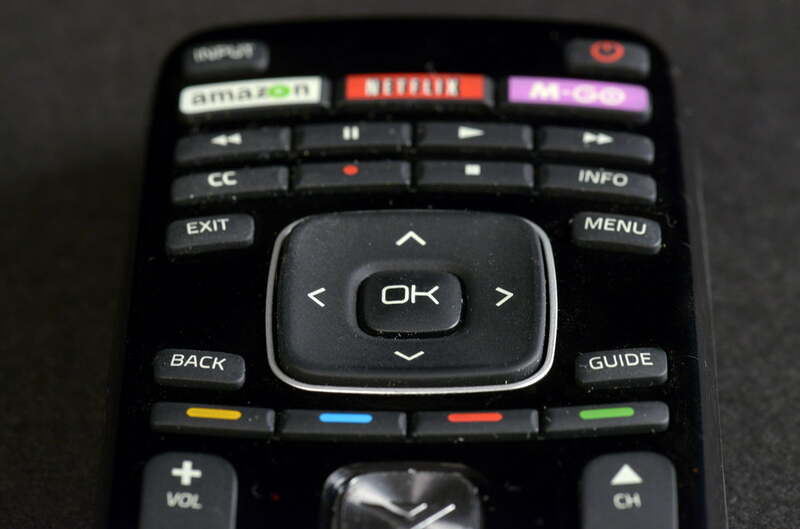 At the top of the remote is a series of buttons for controlling pause, play, and search, which we found extremely fluid in operation with streaming video. More notable is the inclusion of not just a Netflix button for instant access to that app, but one for Amazon and M-GO as well. The E420i comes loaded with an impressive array of apps. The default collection includes familiar names like Facebook, Twitter, Rhapsody, and Skype, and there are even more apps available from the online Yahoo store. Yahoo is Vizio’s preferred search partner, and there are several widgets included like Yahoo weather, news, and sports. As for streaming video, the E420i is packed with all the major players including Netflix, Amazon Instant Video, YouTube, Hulu Plus, and Vudu. In addition to those familiar names are some more unique entries. The “Web Videos” app is a sort of YouTube clone, stacked with random videos, as well as categories like “Channels”, and “Popular”. Browsing through the catalog, we found everything from short clips to full length movies, even stumbling on a Rolling Stones documentary called Under Review that was pretty great, and had only one commercial at startup. Straight out of the box, the E420i’s picture needs some help. Even on the fairly tame Standard setting, colors appeared inaccurate and oversaturated, contrast was askew, and the display was a bit bright, even in moderate lighting. Confounding the issue for the novice is the fact that the E420i comes with 9 different picture modes, with iterations including multiple sports modes, a gaming mode, and the eye scorching Vivid mode. None of them looked right to us with default settings, but thankfully, some very basic adjustments made vast improvements. … we noticed more jitter than we would have expected from the TV’s claimed 120Hz refresh rate. Our first directive was to navigate straight to the “Advanced Picture” setting and turn off overt options like Adaptive Luma, Color Enhancement and the extremely annoying Ambient Light Sensor. These very simple changes made a huge difference in the set’s picture quality. After that, thanks to help from our Spyder4 calibrating device and THX calibration Blu-Ray, we were able to get a solid picture with some key tweaks. Our preferred settings are available at the end of this review. While there was no global picture setting on the E420i for multiple components, we were excited to find that a single adjustment worked across all of the streaming video apps. It’s a simple feature, but a nice time saver for streaming video once you have settings in the sweet spot. With the settings dialed in, we found the E420i delivered a good picture, especially for a 42-inch model priced this low. The set’s LED backlighting did a fine job of supporting crisp, brilliant images on our more dazzling test selections like the Planet Earth series. Colors were generally well rendered, with especially deep blues and reds. We did notice the very brightest whites got washed out in some cases, but, generally we have few complaints. For the vast majority of our viewing we experienced little to no motion blur with this TV. However, while watching the fast paced action and jerky cinematography of The Hunger Games, we noticed more jitter than we would have expected from the TV’s claimed 120Hz refresh rate. Some of the more chaotic scenes like the first melee for weapons were blurry, and a bit of a chore to follow. To be honest, this TV performs more like a 60Hz set than a 120Hz set. We had a chance to try out Vizio’s form of local dimming (called “Smart Dimming”) while taking a journey into deep space with Ridley Scott’s Prometheus. As we watched the movie in a darkened room with Smart Dimming off, we noticed the black levels weren’t as dark as we’d like, with the edges of the widescreen image glowing slightly. With Smart Dimming engaged, however, we noted a striking improvement in black levels. Unfortunately, we also noticed that the image as a whole was affected, looking duller and less vibrant than before with much less shadow detail. Some brightness adjustment helped a bit, but the image never looked as vivid with dimming engaged. Though the issue isn’t enough to put us off of the E420i, we felt it worth mentioning. Perhaps the best thing the E420i has going for it is its Smart TV interface. As mentioned earlier, we’ve scoffed a bit at the need for Smart TVs, since many of the apps can be operated from a component already connected to the TV. However, after living with the E420i for a decent amount of time, we pretty much fell in love with its convenient interface. Launching apps took mere seconds, about half as long as our aging Xbox 360, and navigation was smooth and simple. Netflix addicts that we are, we discovered our favorite Smart feature there. While binge watching Mad Men and Arrested Development, we were delighted to find Vizio’s Netflix app cuts off the intro of the next episode on autoplay, showing only the final screen clip and heading right into the show. It’s the little things that get us, and that kind of user-centric feature is indicative of a company that is paying attention. The E420i’s sound was decent, with little adjustment necessary. While that’s not a glowing compliment, we’ve noticed a serious degradation in the sound quality offered by many of the flat panel TVs we’ve tested recently. If the audio doesn’t immediately make us cringe, we basically count it as a win. Though the E420i’s bass response was expectantly weak, midrange and treble were clean and clear, easily filling the room. 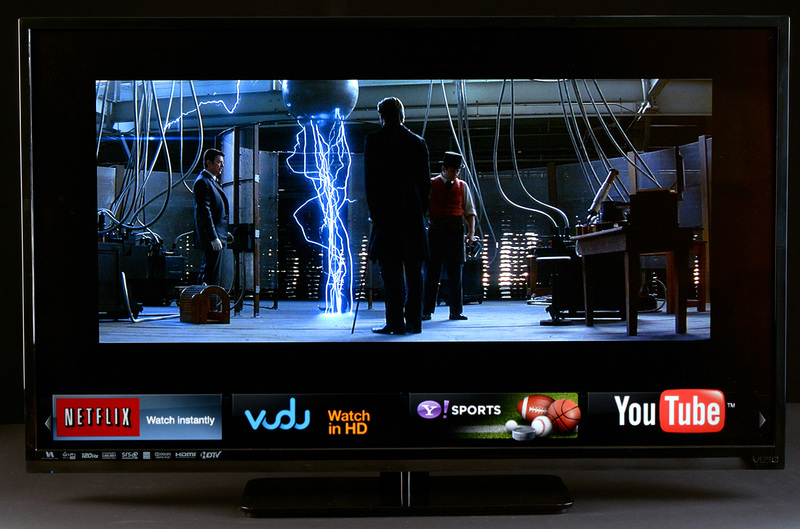 A few minor quirks aside, we think this Vizio TV provides real value. The E420i-A0’s solid picture quality, useable on-board audio and impressive Smart TV interface make it a product we’d be happy to have at the center of our home theater. Those looking to move into the 1080p Smart TV arena without breaking the bank will find the Vizio E420i-A0 a formidable contender.